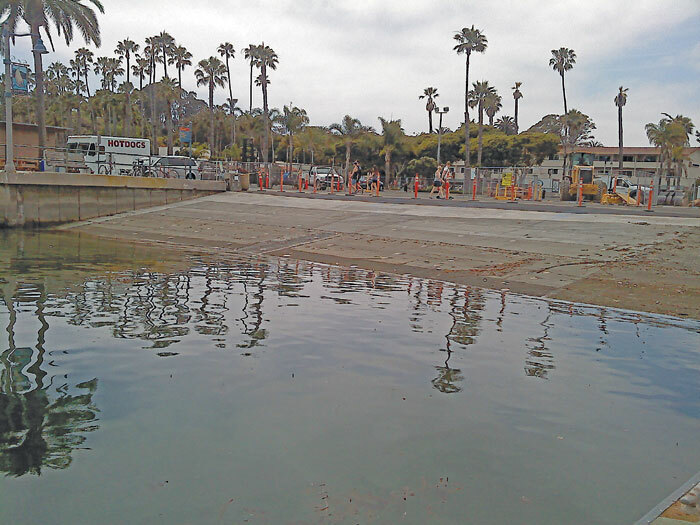 SANTA BARBARA — Boaters heading to Santa Barbara can launch their trailerable vessels can take advantage of a newly renovated launch ramp. Originally constructed in the 1960s, the concrete launch ramp had slowly deteriorated throughout the years, eventually requiring the Santa Barbara Waterfront Department staff to rope off the west side of the ramp. June 25 marked the first time in 10 years that all lanes could be used by boaters. The $350,000 grant from the Department of Boating and Waterways helped pay for replacing the deteriorated concrete and funded the addition of two new launch lanes — located between the washdown area and the existing ramp. Whitaker Construction completed the eight-week renovation project. The latest project completes a phased-in replacement of the entire launch ramp that originally started in 2002. Since that time, the California Department of Boating and Waterways has provided the Waterfront Department with more than $1.2 million in grant funds to provide improved access for boaters. Stand-up paddleboarders and kayakers can access the easterly section of the ramp, which has a low-freeboard dock that is dedicated to non-powered watercraft and sailing dinghies. Those improvements were made under a Department of Boating and Waterways Boating Trails Grant of $450,000.